For many people, music is an essential part of their exercise regime. Research has shown that music motivates and increases endurance levels during exercise and also provides a more positive experience. Taking out a Dual Music Licence from IMRO ensures you can legally use our vast repertoire of music to enhance the sports and fitness experience for your customers. 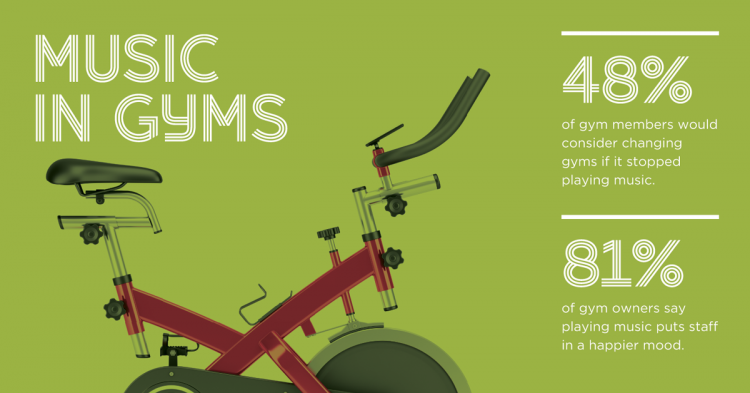 87% of current and ex gym members who attend exercise classes prefer listening to music by original artists. A Dual Music Licence from IMRO may apply to your business if you use copyright music in your gym, health club, public access foyer, refreshment area or keep fit classes by means of radio, TV, online streaming service or any other recorded device. A Dual Music Licence applies to performances of copyright music within the repertoire controlled by IMRO & PPI. If you use music in your sports, social or similar club establishment, a Dual Music Licence may be applicable to you.